I’m not sure exactly when my affinity for window seats began, but I can remember loving them even as a little girl. In college, I begged my dad to drive up 5 hours from Virginia to Philadelphia to build a window seat for my college dorm room. We drove all over the city looking for the perfect piece of wood from the lumber yard. My dad built me a small window seat-ledge that could easily be removed at the end of the year, and I adored that little nook! Now as an adult, my love for window seats still glows strong. 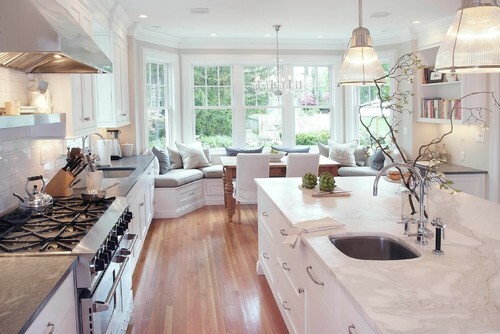 I’m currently contemplating adding one to our kitchen bay area and have been gathering some design inspiration. 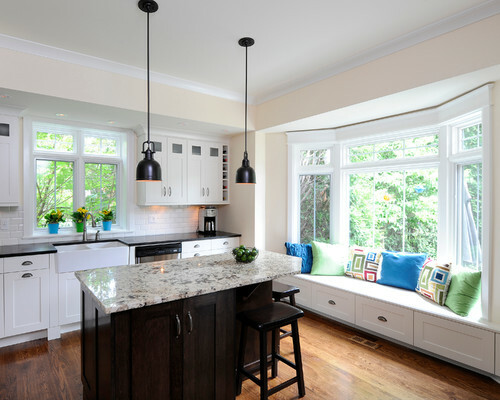 Here are 25 kitchen window seat ideas for you with my design observations and a few links at the end foe do-it-yourself window seat tutorials. 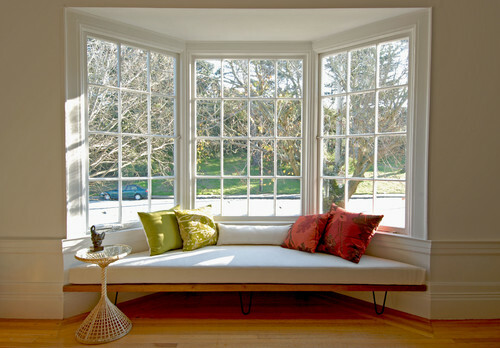 Building a window seat or banquette across a straight wall is a bit simpler than constructing one in a bay window. 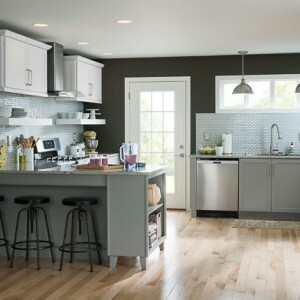 For do-it-yourself options, consider using pre-made wall cabinets from a big box store. 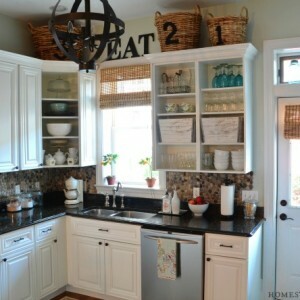 The cabinets give you instant built-in storage and can be painted to match surrounding furnishings. Image and design by JS Interiors. 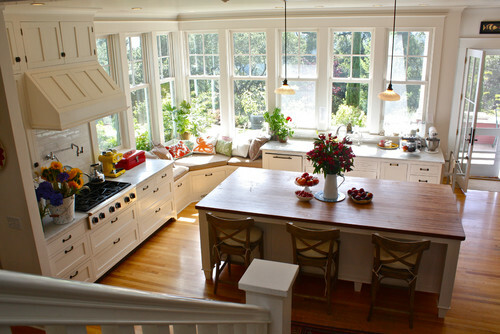 The kitchen is the gathering center in every home. Don’t believe me? 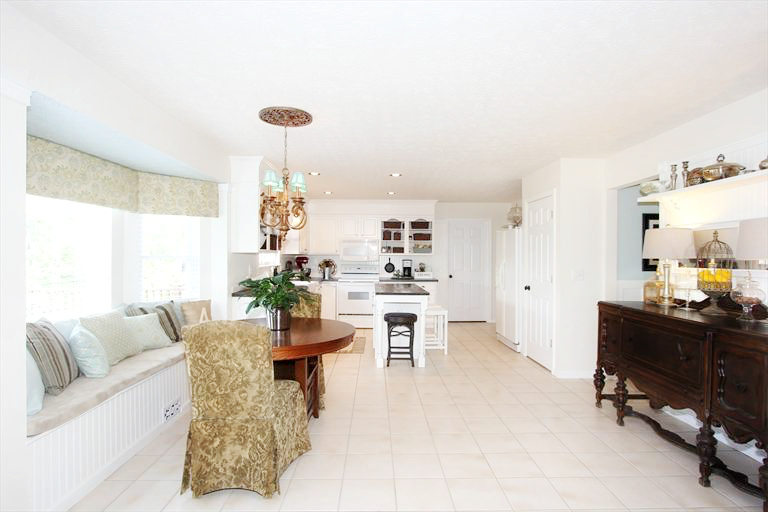 At your next party, pay attention to where everyone naturally congregates right as they enter your home. Chances are good your guests will all gravitate around the kitchen island, chatting or pulling up a chair at the bar or kitchen table. 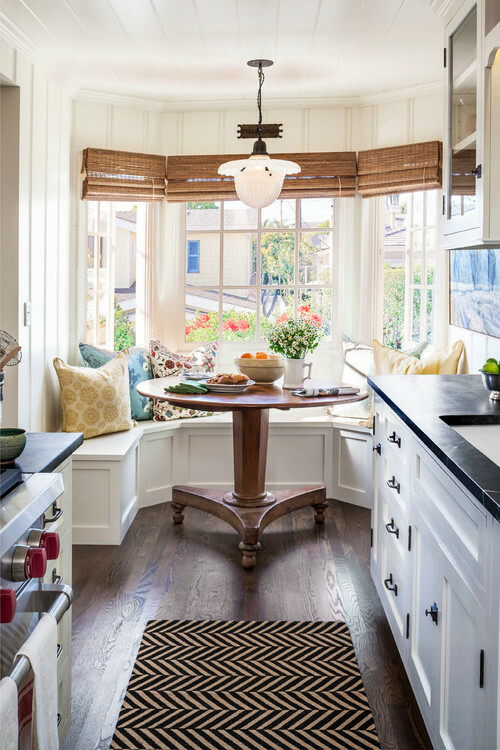 Window seats expand your seating area, making them perfect additions to the kitchen. 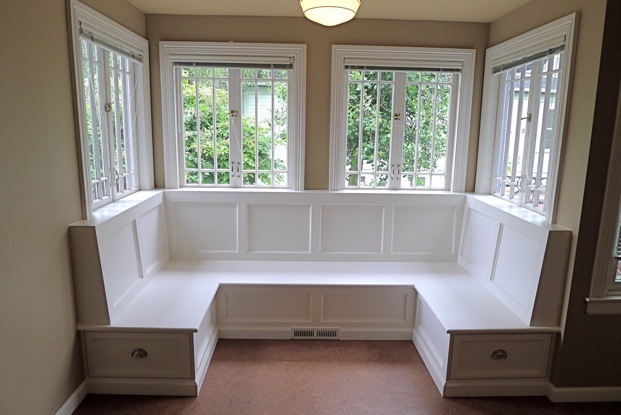 I love how the following window seats were carved out of spaces that would otherwise be wasted. 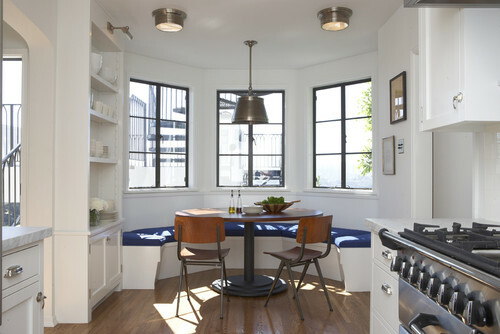 A built-in banquette that hugs the corners of the bay area is a great space saver. 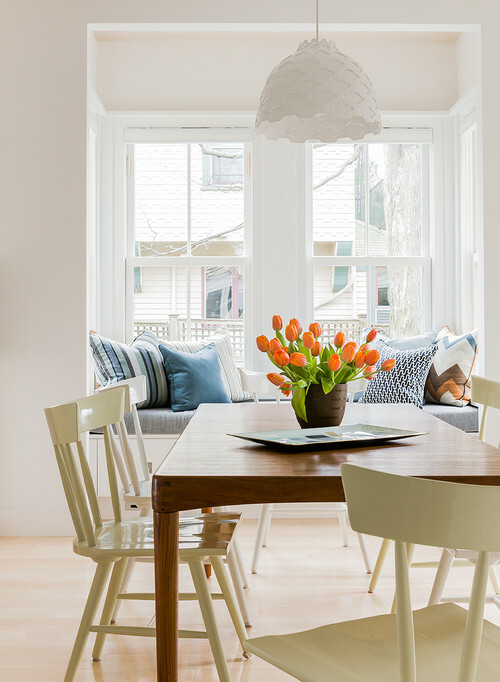 Pedestal tables are obvious choices for these nooks and allow you to maximize your seating around the table. 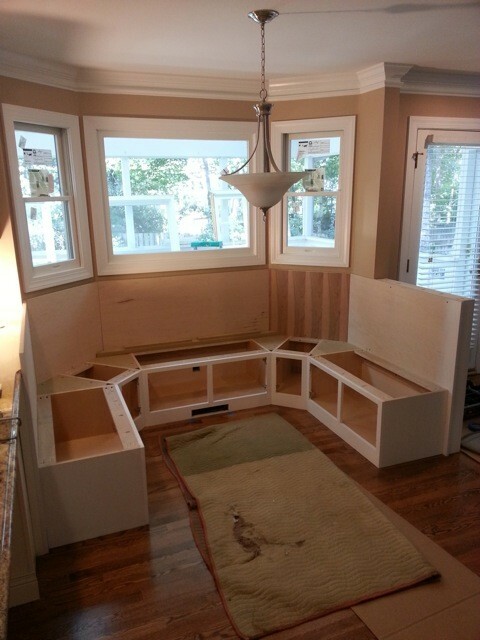 Adding drawers, and lift-storage to the banquette is a great way to have your seating area work double duty. 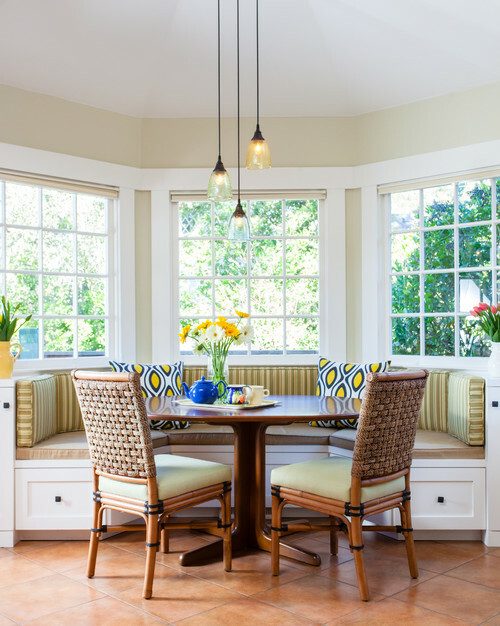 Instead of hugging the corners of the bay or bow window, another option is to build your seat straight across the window. This allows for more curl-up-and-read-a-book space but may decrease the number of seats offered. I’m actually leaning more towards this option for my own space because it seems easier to build and I like the idea of curling up with a book in my breakfast nook! 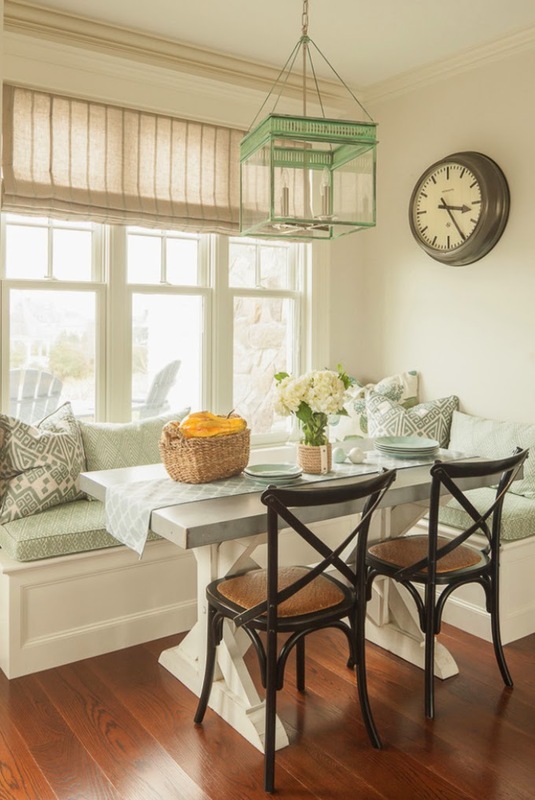 Build a Window Seat Yourself by At the Picket Fence. This isn’t a step-by-step tutorial but the process pictures will give you a good idea of what was involved in the construction of the seat. 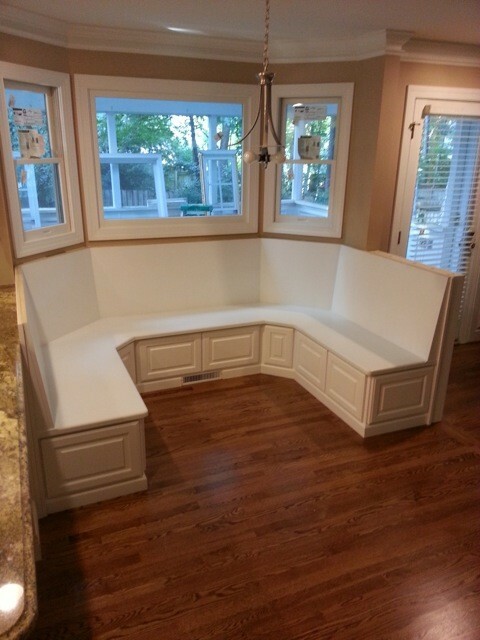 Window Seat with Storage by Contractor Kurt. 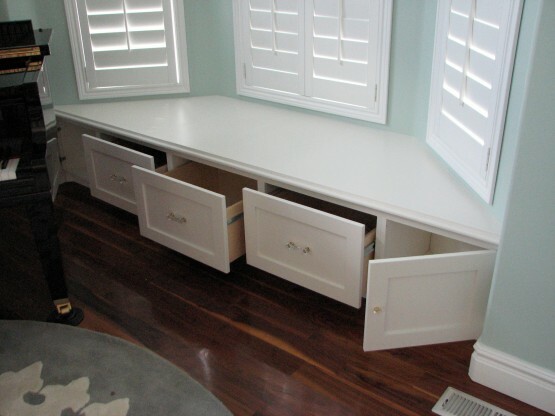 This is an excellent look at how to add drawer storage to your window seat build. 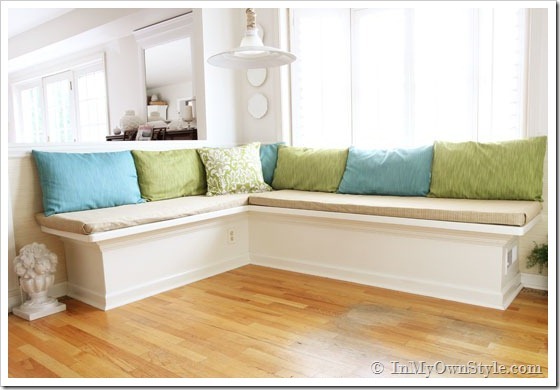 Building a Window Seat with Storage in a Bay Window by Pretty Handy Girl. Brittany always does a thorough job with her DIY tutorials. She even shows you how to appropriately move your air-vent in case you need to redirect your vent. 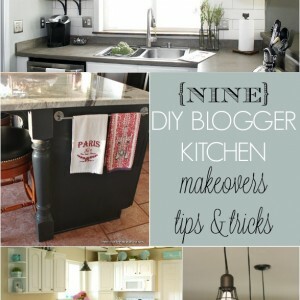 How to Make a Kitchen Banquette by In My Own Style. 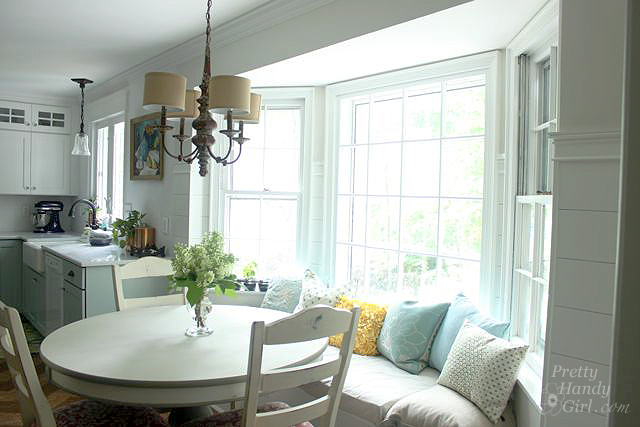 Diane has a great banquette tutorial which includes tutorials for making the finishing cushions. 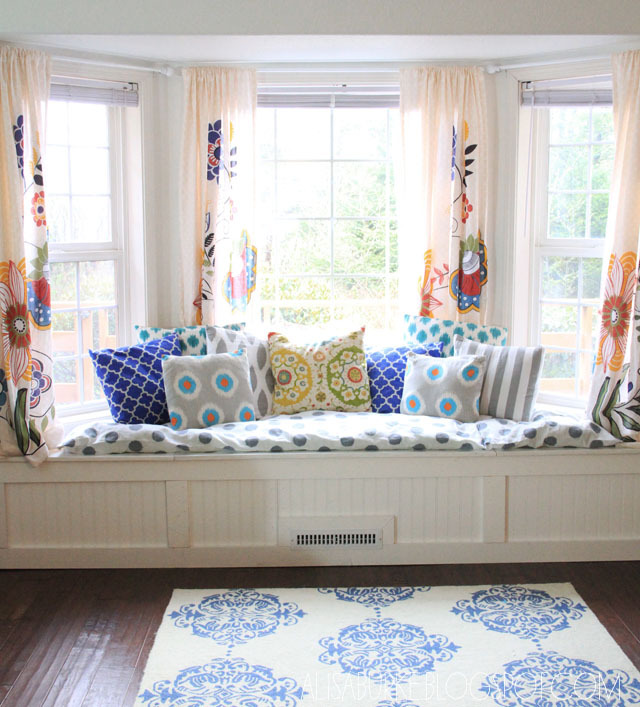 DIY Window Seat Tutorial by Alisa Burke. Alisa also conquers the air-vent problem and gives an alternate solution for redirecting the air. These next two banquettes do not include tutorials but they are helpful links in case you want to build a wrap-around banquette and see some in-process photos. Image via Paul Johnson Carpentry. The beach style dining room is simply amazing. 🙂 Really want a rounded table and bench like those. This is a great post!!! I Love all of these!!! 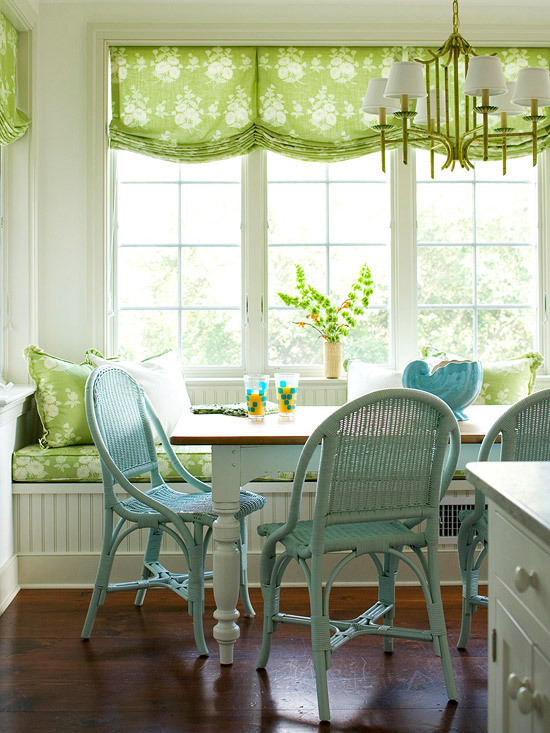 I want to add a kitchen window seat to our bay this year so these are great inspo. 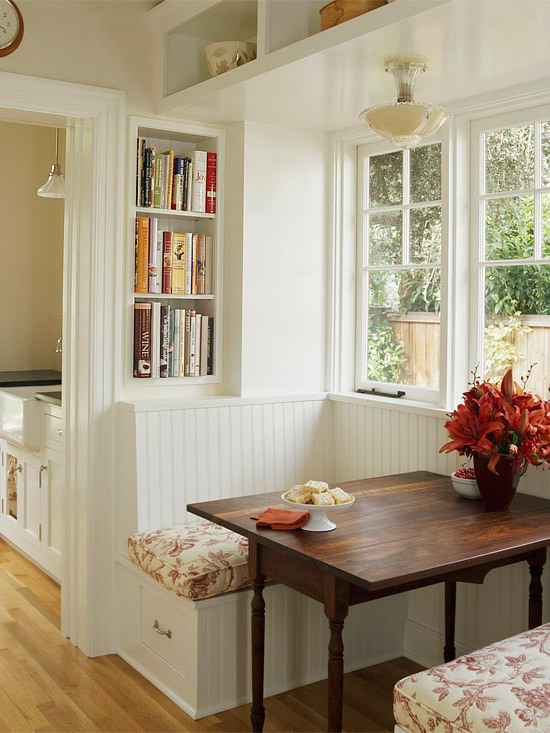 25 Kitchen window seat ideas. A dream of mine for years finally come true!! Thanks for the post. I love this collection Beth! There is something about a window seat isn’t there! Pinned!